My attempt to drink a different beer everyday for a year. Another day…another beer. Lets all have a drink as I slowly approach beer #200 and boy the celebration that will break out all over the world once I do get to #200…I can’t wait and I’m sure you all can’t wait either. 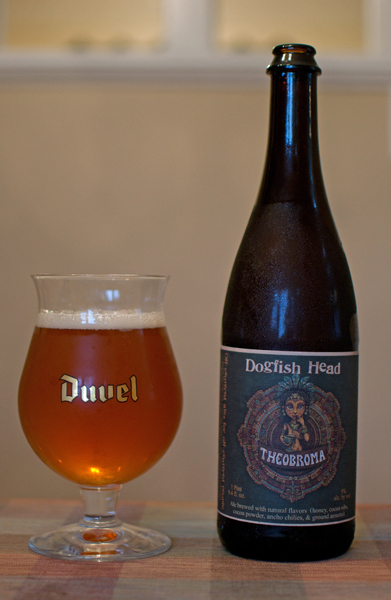 Beer #195 is Theobroma by Dogfish Head from Milton, Delaware. Stats – Chile Beer with an ABV of 9%. Interesting to note is that this brew is based on a chemical analysis of pottery fragments found in Honduras. Appearance – Cloudy amber-orange with a white head that disappeared real quick. Nose – Chocolate morsels (the stuff my wife uses to bake chocolate chip cookies), roasted chili peppers, faint alcohol. Taste – Honey up front, those chocolate morsels take over for the rest of the drink, spicy heat at the end. Mouthfeel – Medium body, moderate carbonation, fairly smooth. “Off-centered stuff for off-centered people”…that is the motto of Dogfish Head and sure enough, this beer is pretty off-centered. It is really cool to think something akin to this might have been used for special occasions around 1200 BC. That is a hell of a long time ago. It amazes how much science goes into making beer and the science behind this (chemical analysis of pottery fragments found in Honduras) is truly amazing. Suffice it to say, for me it was delicious. I love the mix of honey and chocolate…thrown in the spicy heat of chili’s…ding, ding, ding…you have a winner to me. I just wish it wasn’t so expensive at $12.49 a bottle (1 pint 9.4 oz) but then again, I’m not sure how many of these could be enjoyed in a sitting. To be honest, I’m guessing one. All in all though…still an excellent beer and quite the change of pace from the everyday ordinary brew. I, KingBob, am on a royal quest to drink a unique beer a day for 365 days. Won't you join me on my journey? A+ or A = Outstanding...a brew fit for a King. B+ or B = Above Average...a Princely brew indeed. C = Average...let the court Jester drink this. D or F = Below Average...swill suitable only for the Peasants.